I wrote this yesterday after my tech class was over for the day. Would have published it last night but we went to the local Community Writers Group to learn more about how to be a good poet. Ah, the things we do for love. Somehow, it looks like our empty-nest years are going to be filed with lots of reading and writing. 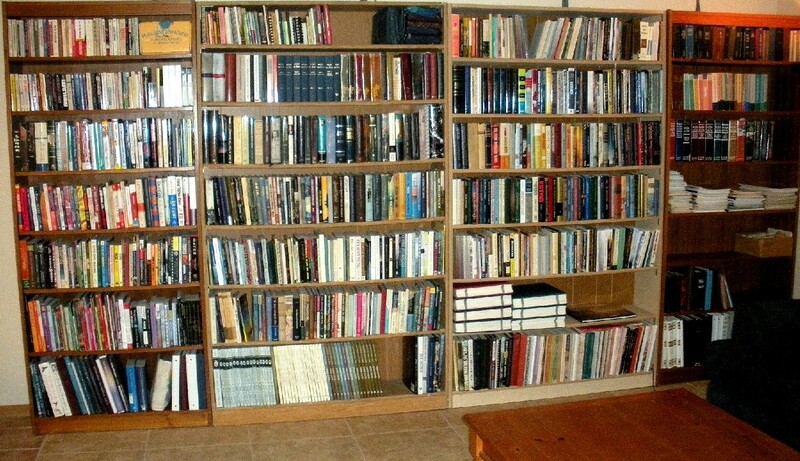 I’ve got a library of over 1,000 books about halfway read. By the way, this is more of a post of just a bunch of personal reflections. Skip it if you want. From the day I started this blog six years ago, I’ve always tried to make it clear that I’m just a normal LDS guy, happy with the church here in California, including the orthodoxy that seems to bug some people to no end. I’ve also tried to make it clear from the beginning I like the controversial stuff that can easily have multiple points of view without any of them being absolutely correct. It doesn’t bug me to have an absolute answer of exactly the way things are supposed to be. If I haven’t said it before, please let me express it now: Thank you for sticking with me. I know I have some long-time readers from way back when. But according to the stats, most have subscribed or visited for the first time in the last year or so. For that reason I sometimes give a quick summary of why I write and what you can expect to find on this blog. I get about 200 visitors a day. Most of you read a couple of posts then move on. That’s OK. I hope you find what you need. If you don’t want to take the time to read my “About me” tab, in a nutshell, I’m an old guy in the church, grew up in the 60’s and 70’s, love the doctrine, or at least the idea of studying the doctrine, love to read other’s points of views on the doctrine, do not consider myself a scholar, but am interested in the controversial stuff (I think I said that). I’ve gone back and forth from orthodox conservatism to libertarian, constitutionalist to even being a little liberal on some important issues. I write because I feel the need to share my thoughts. We have one son who lives up the coast, my wife is a published author and I am a computer guy with some free time late in the day and in the evenings. I don’t watch TV, prefer to eat at home rather than eat out, am forever buying and starting books, and sometimes even finish them in a short period of time. I think I have some eccentric or weird viewpoints of life. For example, like many of you, I feel the end days are near, even upon us, perhaps much closer than we think. I know the gospel is supposed to go into all the world before the Lord returns but it seems to me that it is doing that through technology. I believe we are in for some catastrophic events in the near future. I am a follower of the Electric Universe theory of science. Most scientists don’t know what it is and would vehemently disagree with many of the components. I believe in the reality of the spirit-world, seem to have some sort of gift or unusual sort of connection where I can sense the presence of those from both sides, especially the dark side, and can constantly hear their thoughts if I don’t tune them out. I can pick and choose someone nearby and have a conversation with them. I don’t do this on a regular basis. It’s kind of spooky and I haven’t figured out what good it does so I don’t pursue it. Lately, they’ve been bugging me, causing me anxiety with strong feelings of panic and tremendous constant headaches. I’ve sought all the typical Western healing modalities with no success. I’ve pursued and am still pursuing alternative healers and have decided it’s time to seek psychological help. I’ve got nothing against it. I know they go to school a long time to become certified in how to help people work through their problems so I’ve visited a few in the hopes of finding one that can understand what I’m going through. I’m meeting another one for the first time this Thursday. Of course, most psychologists would say I have a psychosis with this idea that I’m bothered by spirits around me. It’s too bad he’s not LDS. There are few in California, so I’ll have to explain why this is such a big deal to me. I’m specifically doing this because my home teacher said in the latest blessing I should pursue every avenue of healing the Holy Ghost brings to my mind. This is one of them. Besides I look forward to telling my story. I’ve shared it in previous posts on this blogs including links to documents detailing specifically what happened. Did I mention I’m a big fan of Anthony Larson and his prophecy trilogy of books? I am. I’ve written dozens of articles about the stuff I’ve found in his books and on his blog. I think what he has written explains so much about what is going to happen. I hope he gets some credit for having foreseen it once it comes to pass. I’ve been writing a fictional book about a few characters who deal with the events he describes in his books. So far it seems to be fairly well received. We shall see. Some of my favorite authors are Anthony Larson, Doug Mendenhall, Mel Fish, and lately, Denver Snuffer. I have read most of what Denver has written and am in the process of reading the transcriptions of his recent lectures. I have purchased the audio recordings / CDs and have enjoyed listening to them but want to understand better the scriptures he uses in the lectures, thus the transcriptions. Would love to write a review of each lecture, especially his latest on Priesthood. I understand he has five or six more lectures next year and hope to make it to at least one in either St. George, Las Vegas or perhaps in Phoenix in about a year. In the meantime you can find these lectures discussed ad infinitum on the private Denver Snuffer forums found about the Internet. I’m grateful for these smart people, many who know him, who have some radically different viewpoints than I do about what he teaches. I happen to think he’s a pretty good teacher and am sorry he was excommunicated but that doesn’t bother me. I know truth when I hear it. I’m finishing up a technology recertification year this week. I just did the final tally. My employer was gracious enough to allow me to attend 94 days (752 hours) of Microsoft, VMWare, CompTIA and other technology classes this year. I now have sixteen exams for which to prepare. Some of the exams are five hours. I haven’t heard it called this, but in my book, it’s like getting a Master’s degree in Network Administration. I’m not looking for a new job but it’s nice to bring my knowledge current in the small world of technology I inhabit. There are so many others. Not bad for an old guy. No high-five’s until I’m done. But what will the technology certifications matter in the end? They are already outdated. It’s the hours studying doctrine I need to increase. For that reason I printed out each of the five lectures from Denver Snuffer today. Having already listened to then, I know there are some amazing things in them. 132 pages so far. Denver has stated the content was given to him by the Lord, something he wanted us to know for our times. No matter what you think of Denver Snuffer, that is quite an accomplishment so far and he still has I think five more lectures to do. Carol and I continue to read the scriptures every night before our nightly prayer. Some nights the readings are short. Other nights the discussions are deep and heart-felt. We love this church and gospel both. You may wonder how I can say I like to read what Denver Snuffer has to say about things, but it doesn’t bother me. The Church has blessed my life and I am extremely grateful. It brings me happiness, friendship, fellowship and opportunities for service. God bless our prophets, apostles, bishops and Stake Presidents. None are perfect, but I’m amazed at the hours they put in. I know the General Authorities get a living allowance, but I work and have worked all my adult life in bishoprics. I know these men love the Lord and the Saints. I guess my point is I want to make it clear someone can read the writings of an excommunicated member and still remain faithful and love this church. I’ve said it before but I’ll say it again. There is nothing in the temple recommend interview that asks if you read books from former members. The only question that comes close is “Do you support, affiliate with, or agree with any group or individual whose teachings or practices are contrary to or oppose those accepted by the Church of Jesus Christ of Latter-day Saints?” No matter how you slice it, I can’t see how reading books by former members could put one in that category. What do you think? Will the day come when we’re called to account for what doctrinal stuff we read? I was interested to hear that you are a proponent of the electric universe. I am unfamiliar with the website you linked to; however I have been thoroughly enjoying the web casts of Jim McCanney at jmccanneyscience.com. I will have to peruse the website you linked to. Thanks! And. as far as Denver Snuffer goes, the word is that if the people who are following the lectures are taking in and studying the material, the next talk in spring will be a “barn-burner”! Exciting stuff ahead! Nice comment Geoff. Now is the time to be Zion. 16 Nevertheless, I did look unto my God, and I did praise him all the day long; and I did not murmur against the Lord because of mine afflictions. How do you praise all the day long?